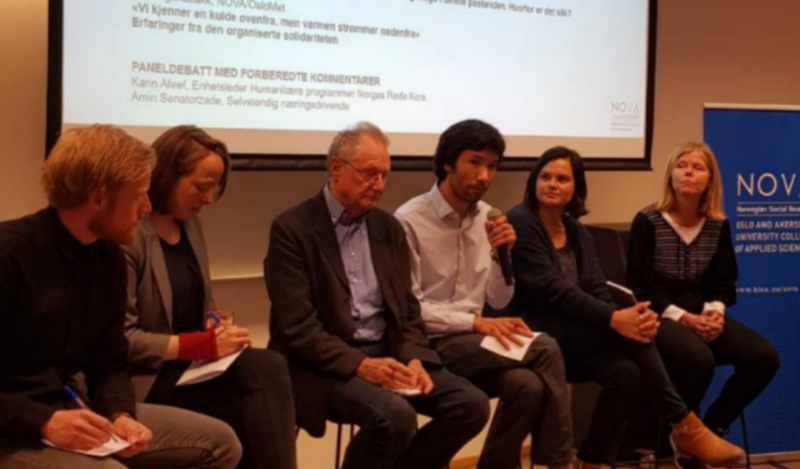 On Tuesday 17th April, the Norwegian SOLIDUS team were involved in a closing seminar where the overarching topic was the boundaries of solidarity. Research Director Are Vegard Haug (NOVA/OsloMet) was the moderator. Bjørn Hvinden welcomed the participants by giving a brief presentation, firstly presenting the SOLIDUS project in general, and secondly, going into more detail and presenting the tasks that the Norwegian team has been responsible for in particular (mostly related to WP4). Professor Steinar Stjernø (OsloMet) gave the keynote speech, where he discussed the concept of solidarity in relation to where – and how – its boundaries can be set, and to what extent there is a potential for change in such boundary setting. Towards the end of the speech, he touched upon issues related to refugees and immigrants. Marianne Takle (NOVA/OsloMet) thereafter gave a presentation on the paradox of appeals to solidarity in Europe. The ideal is for member states to voluntary agree on a ‘fair’ distribution of refugees between them – but at the same time, the EU threatens with legal consequences for those who do not comply. Kristian Heggebø (NOVA/OsloMet) and Ida Tolgensbakk (NOVA/OsloMet) presented results from the SOLIDUS report “Barriers and facilitators for Post-Crisis Solidarity in Europe” (D4.2). Heggebø talked about hostility towards immigrants – and particularly Muslims – by summarizing existing statistical evidence in Europe. Tolgensbakk showed that even though the political climate in Norway has become ‘colder’ in recent years, as evident by more stringent immigration policies, there is still considerable ‘warmth’ from below, as exemplified by vast volunteer activity in the wake of the so-called Migration Crisis in 2015. In the final part of the seminar, all presenters joined in a panel discussion. The panel discussion started with prepared comments on our empirical findings and conclusions from two stakeholders: Karin Afeef from Norwegian Red Cross and Amin Senatorzade, a refugee from Afghanistan. The discussion focused on the fact that, despite some worrying tendencies as to solidarity with refugees/immigrants, there are also noticeable positive developments in how the majority population perceives refugees/immigrants. One of the ‘take-home-messages’ from the discussion was that we need to be better at communicating to the public how well integration is going overall.